Where did Citrus Originally Come From? After a hundred years of Citrus prosperity in Florida, it’s hard to imagine oranges coming from anywhere but the Americas. Historically, however, citrus traveled an immense distance before finally arriving in the Indian River area. The New World in 1493. 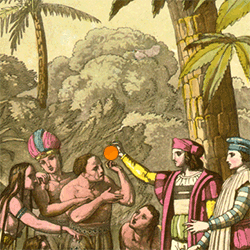 Citrus was actually introduced to The New World on November 22nd, 1493 by Christopher Columbus on his second voyage to the Americas. At the time, Citrus’ ability to cure scurvy wasn’t yet understood, so Columbus’ decision to bring it aboard was deliberately to test its ability to grow in the new soil along with other plants and livestock in what is now Haiti. At the time, citrus fruit was a symbol of luxury and health in Europe, having spread over hundreds of years from the Middle East, China, and India along centuries-old trade routes. Before that, there isn’t a lot of historical information. 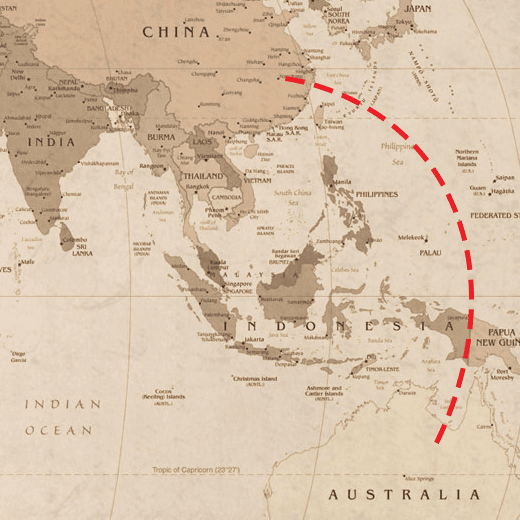 Until recently, most historians agreed that citrus probably originated in Southeast Asia. Scientists have since found clues in the genetic code of citrus that help them gaze back even further in time. 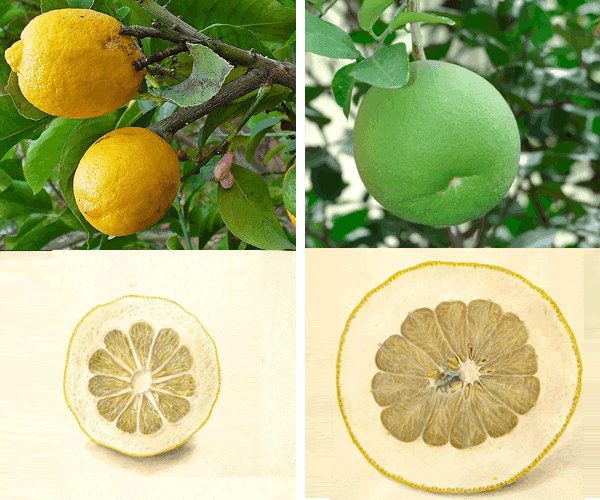 Their research shows that all citrus fruits come from mutations of the citron, the pummelo, or hybrids of the two. This, along with still more research suggests that these ancestors to the oranges and the grapefruits of today actually came from Southeast Asia’s neighbor, Australasia. This is the group of land masses which include Australia, New Guinea, and New Caledonia. 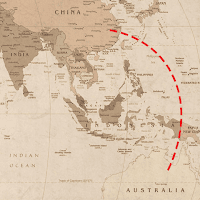 Nobody is certain how they made the jump to Asia, but one of the more interesting ideas is that they simply floated there once they fell off of the trees along prehistoric ocean currents. It’s interesting to think that thousands of years before Columbus braved the oceans to bring citrus fruits to America, they could have already spent untold hundreds of years on their own sea voyages without ever needing a boat. "Pomelo" by Biswarup Ganguly is licensed under CC BY 3.0. The original image was cropped for inclusion in the above graphic. Why is Indian River Citrus better than other Florida Citrus? 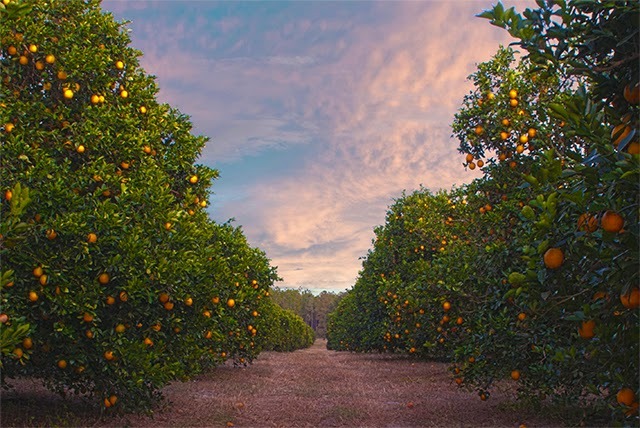 It’s well known that the Oranges and Grapefruit that grow near the Indian River are the absolute best in Florida, but what’s so different about the Indian River area? Why does it produce better fruit? 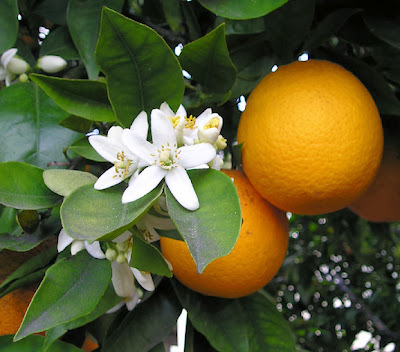 The composition of Florida soil is ideal for citrus. The soil needs to drain well so that the shallow roots aren’t submerged in water during Florida’s rainy season. Everyone can probably guess that Florida’s heavy rainfall is great for producing juicy citrus, but few people know that too much rain will actually kill the tree. There must be plenty of minerals and nutrients in the soil for the trees to grow healthy. 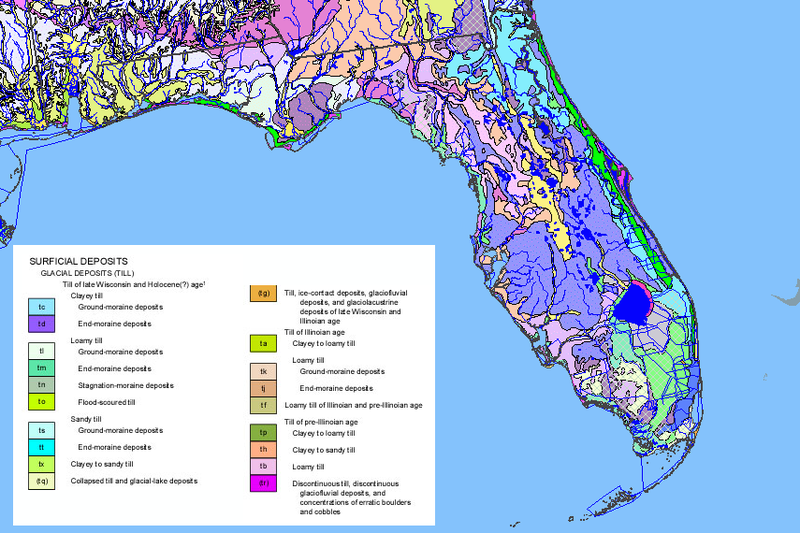 Since Florida is a peninsula, most of the soil throughout the state is very sandy. This is great for drainage. The sandy soil rapidly drains away the water after heavy rains. But sandy soil usually isn’t very nutrient rich. 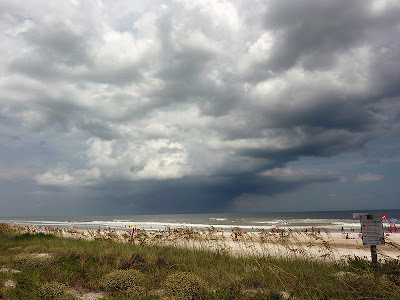 Florida's sandy soil does a great job draining a high quantity of rainfall. 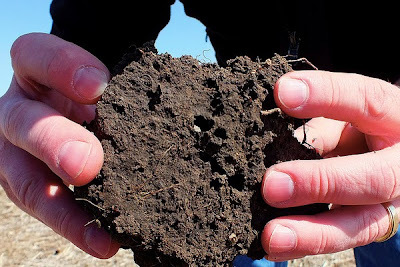 Sandy soil has a low Cation Exchange Capacity. This intimidating phrase is just a measure for how well the soil holds on to nutrients. So sandy soil isn’t enough for growing great citrus in Florida. At this point, you can probably guess why Indian River citrus is the best in the world… better nutrients! Much of the soil around indian river is loam soil, which means it is made up of sand, clay, and silt. Clay and silt have a much higher Cation Exchange Capacity, which means Indian River soil does a much better job of storing all of the nutrients needed for healthy citrus trees. 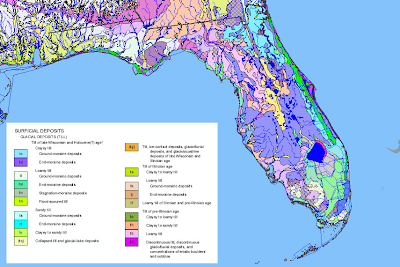 The colors on this map represent different types of mineral deposits found in Florida's soil. Note the green band that runs along the Indian River. So it’s not just your imagination – Indian River citrus really is better. Just memorize the phrase “Cation Exchange Capacity”, and you’ll be able to impress your friends the next time you’re talking about Indian River citrus. 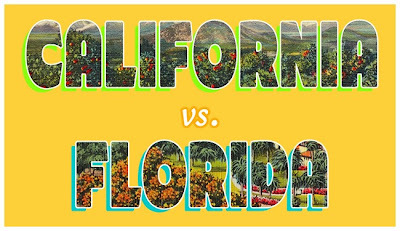 California vs Florida Oranges, What’s the Difference? What’s the difference between California and Florida oranges? Is there a difference at all? A navel orange from Florida has to be the same as a navel from California. Right? Well, even though many of the fruits are genetically identical, the climate changes the fruit far more than you’d expect. 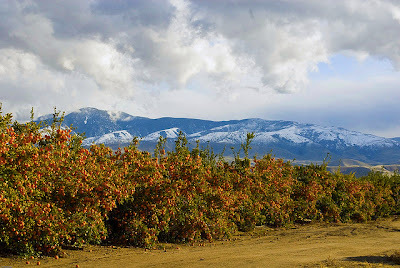 A California orange grove in the shadow of a snowy mountain. California’s climate is very arid with very low yearly rainfall. The days are hot and sunny, and the nights are dry and cool. This weather is ideal for raising oranges with thick, beautiful peels. The dry air keeps superficial blemishes from forming on the peels, making them attractive to supermarket shoppers. Having a thicker peel also aids in keeping them fresh for extended periods. They are ideal for brick and mortar stores, because they last much longer on store shelves. The oranges that grow in Florida do so in a hotter, wetter climate. As a result, these oranges are much juicier and sweeter. In fact, the majority of Florida’s oranges are used for juicing. The peels are usually thinner, and the oranges are easier to eat out of hand. This makes whole Florida oranges ideal for direct shipping rather than supermarket sales. Since our oranges are shipped straight from the grove to your door, there’s plenty of time to enjoy them. Florida oranges typically last 2-3 weeks when refrigerated. If you’re looking for picture perfect fruit with a flawless peel, then you should choose California Oranges. If you are looking for the sweetest, juiciest fruit available, choose Florida Oranges. Of course, as Florida orange growers we’re probably biased, but we think that taste is the most important characteristics of great citrus. 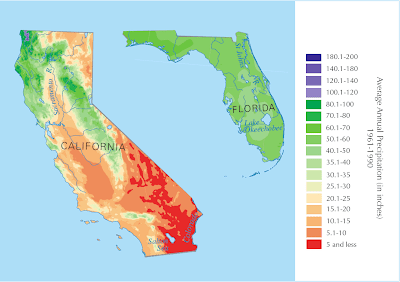 California vs. Florida precipitation map adapted from Precipitation of the Conterminous States by nationalatlas.gov. Where Exactly Does Indian River Citrus Come From? For over a hundred years, the “Indian River” name has been synonymous with the the sweetest, juiciest citrus in the world. Where exactly is the Indian River, though? Where do Oranges and Grapefruit have to grow in order to gain the coveted title of “Indian River Citrus”? Well, first off, the Indian River isn’t actually a river at all. It’s a lagoon. Actually, it’s three lagoons, all of which merge into an enormous, 156-mile, Floridian waterway that reaches from Volusia County to Palm Beach County. This lagoon is notable for more than just its size. Its water is brackish, a mix of salt and fresh water, and it is the single most diverse estuary in North America. With over 4,300 native plant and animal species, the Indian River Lagoon area is a biologist’s heaven, our own little Amazon rainforest. The diverse nature of the Indian River Lagoon’s water sources along with its proximity to the Gulf Stream also help to create one of the best climates in the world for growing citrus. This brackish, nutrient-diverse water enriches the water table just beneath the topsoil, lending nutrients to otherwise sandy soils. 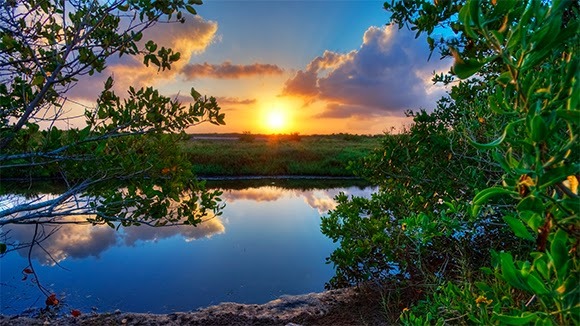 The lands officially designated as the “Indian River Area” surround the lagoon on all sides, creating a band of citrus heaven that stretches for more than 200 miles. When compared to the total amount of land dedicated for growing citrus in Florida, much less worldwide, it’s remarkable to know that the best citrus comes from such a small and unique area. * Due to fluctuating fuel and shipping costs a $2.00 charge is added for items over 20lbs plus an additional $5.00 per item shipped to Western US or $12.00 to Canada will be added to your total.